Yea Good Day,While Android 6.0 is one of the most advanced Android versions and in this version, there have been lot’s of improvements, stability factors included by the Google that is the developer. Still, after so much advance corrections and stability inductions some of the issues are still bound to its interface and the users have reported for these issues. “Screen Overlay Detected” is one of such issues or the error that have been reported by the users, according to them the error mostly occurs with the apps that brings up the floating interface on the screen or on the top of the Android interface. This error hence blocks the usage of such apps and also tends to close them sometimes. Now for the users, this might be so difficult to find up the fix for the condition by themselves but they could only work with some of the basic settings. To help out the users we have written about the method through which this error could be fixed in this article, Just go and read on to know about the method! The method is quite simple and easy and you juts need to follow the simple step by step guide discussed below to proceed. 1. Find up to the app that is probably causing up the error on your device, you can do that easily by running up every suspected app with floating messages, menus etc functionality for sometimes. You could get up the error for certain defaulted app and hence you get up your faulty app. 2. Now once you have got up the app that is causing up the error “Screen Overlay Detected” then head over to the Device’s settings and then go to the Apps Settings from there. You could be able to see the gear icon on the high corner of the settings screen, just tap on it. 3. Follow to the “Special Access” option from the corresponding screen and then tap on the other option “Draw Over other apps”. You can easily locate this option if you are on the right screen unless recheck the previous steps perfectly. 4. In this page, you will be able to see all of the apps which utilize the Screen Overlay permission. Look for the app you found to be malicious and causing up the issue from the list and tap on it. On the next screen you shall be seeing the option “Permit drawing over other apps“, you have to enable it by the toggle button. 5. You would get your device working perfectly again and there shall be no such error you will see again on your device but still if you feel like that the error persists even after disabling the suspected app then you can disable this permission for all the apps on your device. This would definitely fix “Screen Overlay Detected” error. 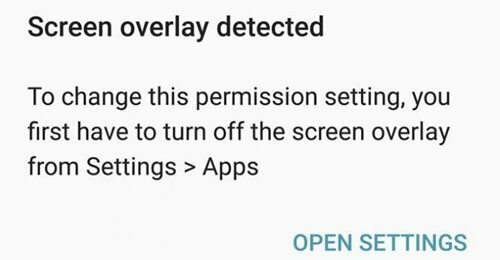 This is the method or the way through which you can easily resolve up the “Screen Overlay Detected” error on your Android device while using up the Apps that utilize up the floating screen functionality. You just need not go through any complex settings or tasks but simply apply the given method that is not at all difficult as you might have got up. So now just go and use up this method to solve out the “Screen Overlay Detected” error on your Android device too if you are countering any such error.